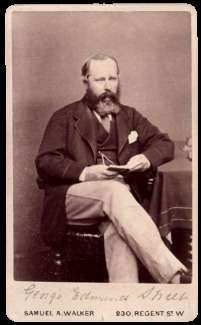 George Edmund Street was born in 1824 at Woodford in Essex, the son of a London solicitor. Although he was educated to follow in his father’s footsteps, in 1840 – less than a year after his father’s death – he was articled to a Winchester architect, Owen Browne Carter. 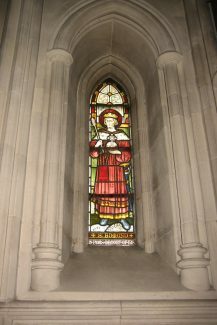 From a very early age he had been keen on drawing and sketching, and churches were often the subject of these drawings. From 1844 he was an assistant at the busy offices of Sir George Gilbert Scott. 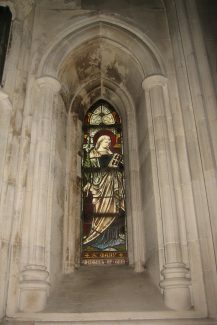 Scott’s influence is shown throughout Street’s work as Street tended to favour the Gothic style. In 1849 he set up in practice for himself. For three years he travelled around Europe, studying early Gothic architecture in Germany, Italy, and France. In 1852 he married his first wife and became surveyor and architect to the diocese of Oxford, only returning to London in 1856. The hard-working Street was much in demand as an architect, building numerous schools and chapels, as well as a large number of churches. It was during his time in Oxford that George Edmund Street probably met the Reverend Thomas Espinell Espin, a fellow of Lincoln College, Oxford. In 1853 Rev. 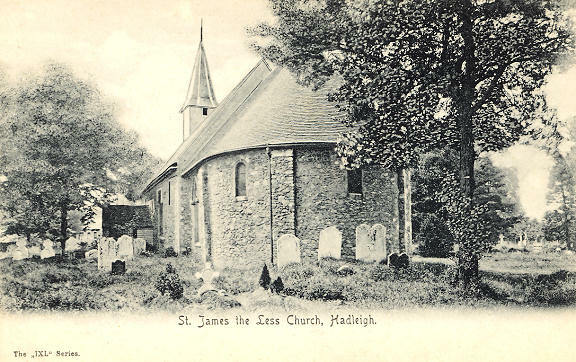 Espin was appointed rector of Hadleigh and found the parish church of St. James the Less in a dilapidated state of repair. Street was commissioned to undertake repairs to St. James the Less, and to design a school and a new rectory in the village of Hadleigh. 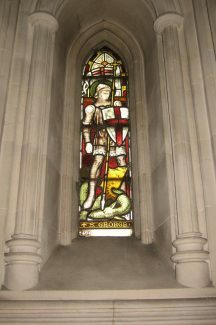 George Edmund Street instituted a restoration programme for the church, including the repair of the roof and east wall. 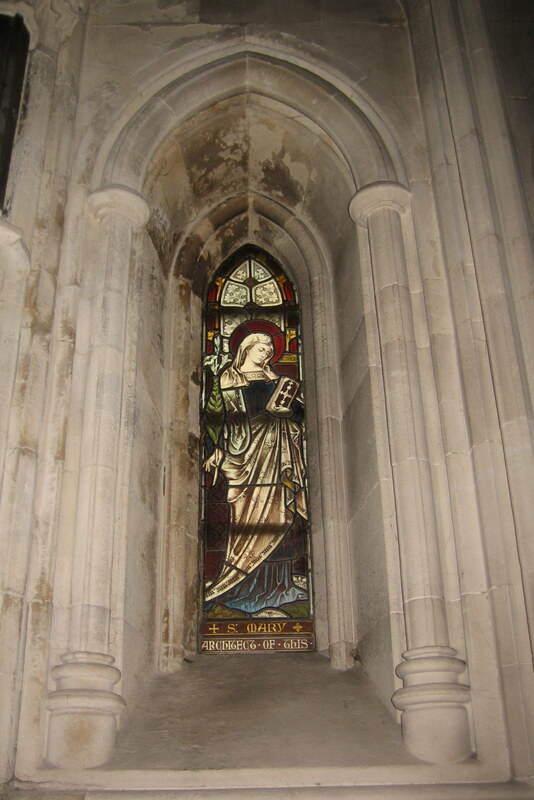 It was during this restoration that medieval wall paintings and Jacobean texts were discovered. The old rectory, which had fallen into disrepair and disuse, was demolished. 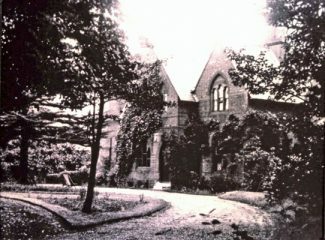 The new rectory, designed by George Edmund Street, was built on the same site, but slightly to the east of its predecessor. Completed in 1856, it cost £2,000. However, it is the school building which still stands in Hadleigh today as an example of Street’s genius as a Victorian Gothic architect. Few people passing by Sandcastles Nursery know the extraordinary story of its time as Hadleigh’s first dedicated school building. By the time of his death in 1881, George Edmund Street was considered by many to be one of the greatest Gothic architects in Europe. He designed about 260 buildings during his professional career, the majority for ecclesiastical use. Street’s buildings were usually highly original, unconventional adaptations and bold restylings of 13th-century French and English Gothic architecture. His most famous work, however, was a secular building, the Victorian Gothic Law Courts in London. He was appointed sole architect in 1868, work began in 1873, and finished in 1882, after Street’s death. He was also a close friend of many of the Pre-Raphaelite artists. By 1871 he was a Royal Academician, becoming professor of architecture at the Royal Academy. In 1874 Street was awarded a gold medal of the Royal Institute of British Architects, and was President of the RIBA at the time of his death in December 1881, at the age of 57. As a highly revered architect, he was awarded th e rare posthumous status of being buried in Westminster Abbey. The residents of Hadleigh should be proud that such a gifted man has left the legacy of the restored parish church and the old Victorian school building. Whilst on holiday in Dublin, I visited Christ Church Cathedral, which was extensively renovated and rebuilt from 1871 to 1878 by Street. It was during the period he was working in Dublin that George Edmund Street married his second wife, Jessie Mary Anne Holland. The wedding took place on 11 January 1876 at All Souls Church, Langham Place in Marylebone. Sadly, Jessie died two months later, on 6 March 1876, at their home at 14 Cavendish Place in Marylebone. 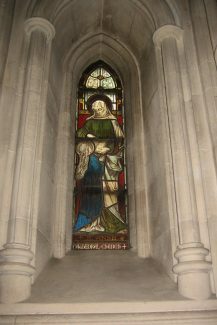 The stained glass windows in the Christ Church baptistery were presented to the cathedral by Street in memory of his wife. 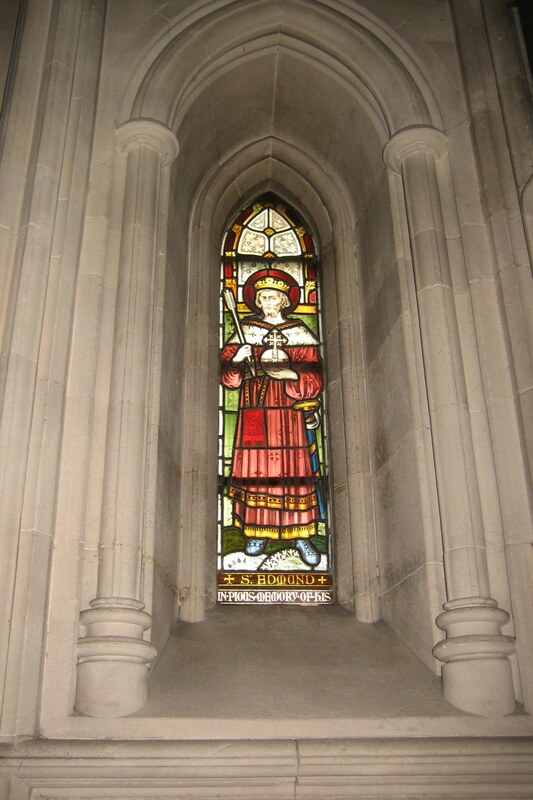 He designed ten stained glass windows depicting mostly Irish saints. 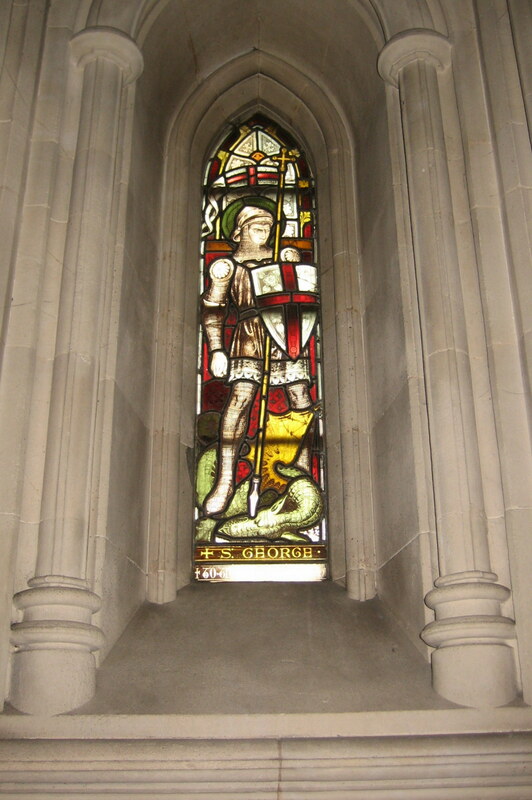 However, the first two windows are of St. George and St. Edmund, while the last two are of St. Mary and St. Anne, named for Street and his wife. Here is the second article about George Edmund Street.